Bendpak - RS-500 Professional Spray Wash Cabinet with Skimmer - Gary Bloom Sales, Inc.
An increased cabinet size and larger solution tank makes the RS-500 more versatile and productive. By using an octagonal full-opening door, we’ve enhanced access to the turntable to enhance the operator’s loading capabilities. 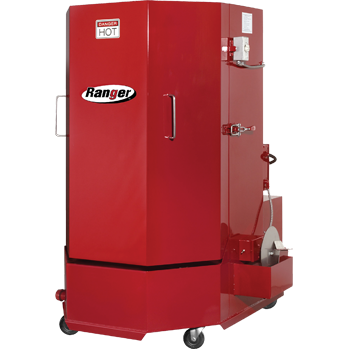 Simple operating controls, brass nozzles, a gasket-free door and a high-capacity 70-gpm pump demonstrates Ranger’s commitment to enhanced performance and productivity without a single sacrifice in quality. 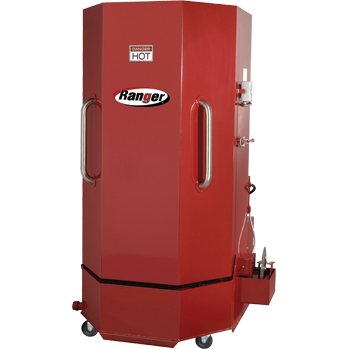 Like all Ranger spray wash cabinets, the RS-500 is built to last. We constructed the cabinet and door with heavy-duty 12-gauge steel and then coated it with an industrial two-step primer and powder coat finish. All-around performance, durability and improved operator convenience make the RS-500 the definitive choice among professionals worldwide.